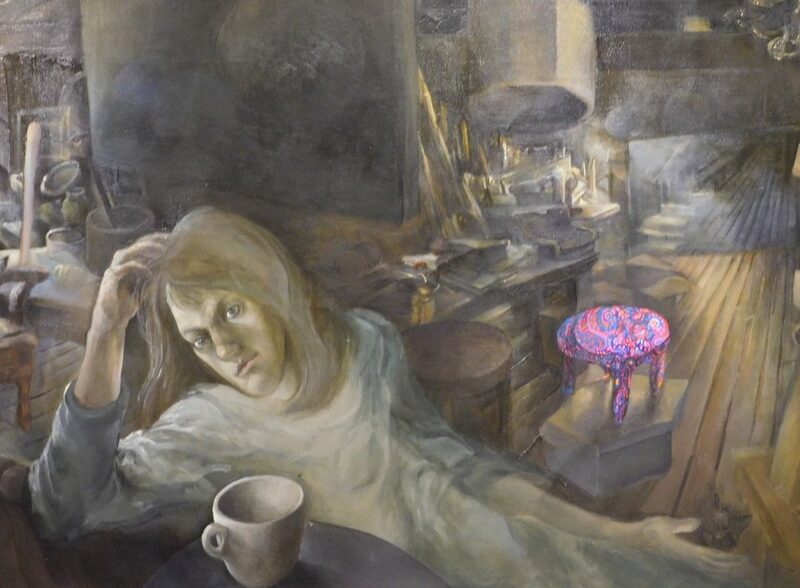 The Thomas Center Galleries opens a fascinating exhibit during this month’s Artwalk that examines the paintings, prints and life of Louise Leak, whose finest work was found in a California garage almost 40 years after her tragic death. Jane Myers has quite a story to tell about her late sister, the artist Virginia Louise Leak. 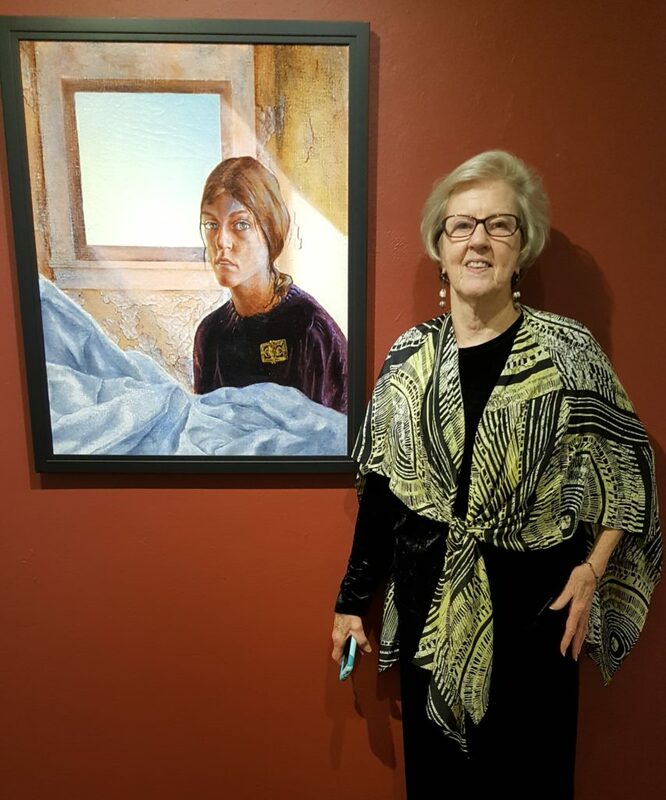 Now the longtime Gainesville resident is ready to share that story with the community through an exhibit of Leak’s work at the Thomas Center Galleries. “Into the Light: The Rediscovered Paintings and Prints of Louise Leak” debuts Friday night in the first-floor Main Gallery of the Historic Thomas Center, 302 NE 6th Ave. The exhibit’s opening reception takes place from 6:30-9:30 p.m. during the monthly Artwalk Gainesville. The event is open to the public, and the exhibit will continue into the summer. 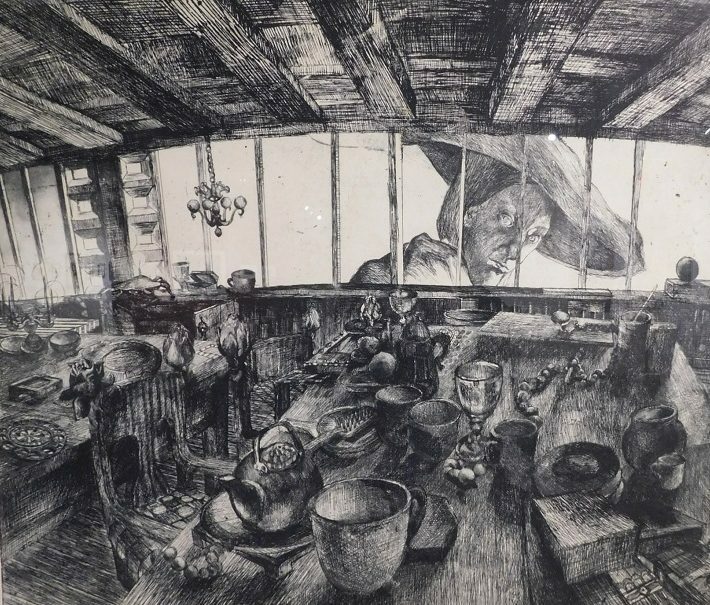 Leak’s story is that of a prolific artist who immersed herself in the Southern California art scene in the early 1960s and produced everything from exquisite small prints to virtuoso major works while battling mental illness. She died in 1978 of asphyxiation after choking on peanut butter. She was only 37 years old. Leak’s story could’ve ended there, in the same Parkland Hospital in Dallas where President Kennedy had died 15 years earlier, and her remarkable works never fully appreciated by future generations. Just another forgotten artist. 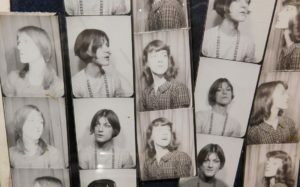 A collection of face shots of Louise Leak from the 1960s. And that was pretty much the case until 2015. That’s when the telephone rang in Jane Myers’ home in the historic Duckpond neighborhood of downtown Gainesville. “‘Are you Louise Leak’s sister?’ the man on the other end of the line asked me,” Myers recalled. That man was Darryl Curran. He explained that he was calling from Santa Monica, California, and recently widowed. His wife, Doris, had befriended Louise Leak many years ago. Now Curran, a noted photographer, was going through the house and sorting out his late wife’s personal possessions. “He said, ‘I want you to know I have these large plastic bags in my garage with the name Louise Leak on them. I haven’t opened them yet. What do you want me to do with them? '” Myers said. Later that week, Myers and her son spent three days in Curran’s spacious living room opening the black plastic bags. Inside the bags was rolled-up artwork. They carefully unrolled one Louise Leak painting and etching after another — 37 in all. One by one, they taped each piece of artwork to the hardwood floor and photographed it from a stepladder. Thanks to the dry climate, not a single one was harmed by mold or mildew. 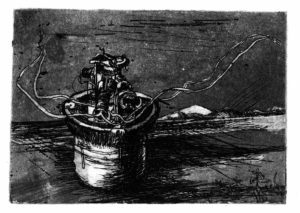 An untitled etching by Louise Leak. According to Myers, Curran “did his homework” tracking her down in Gainesville. He’d remembered that Louise Leak had mentioned traveling to Nova Scotia for Myers’ wedding in 1963 and that her groom was the great-great grandson of Alexander Graham Bell with the surname Myers. The Internet’s breadcrumb trail led to Gainesville. Myers had her sister’s rediscovered work shipped to Gainesville in a crate containing three dozen oversize cardboard tubes. Two years ago, Thomas Center Galleries curator Anne Gilroy became aware of Myers’ collection through Michelle Karahalios, a local real-estate broker and artist. Gilroy, along with art connoisseur Héctor Puig, visited Myers’ home and took a look for themselves at the work of Louise Leak. Detail from a self-portraiture painting by Louis Leak in her hayloft apartment in Los Angeles. Gilroy noted that, first and foremost, Leak was a printmaker. Some of the prints were as small as 2 inches square and others extremely large. The subject matter often included botanical images because Leak had aspired to be a botanical illustrator. 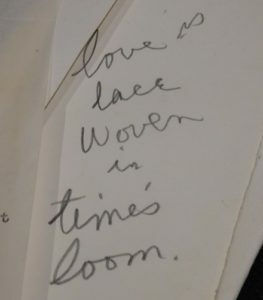 One of the pieces on display in “Into the Light” is a botanical line drawing Leak gave to her sister on her wedding day. Much of Leak’s work involved self-portraiture, reflecting her perception of the world. A few of the images take the viewer into Leak’s hayloft studio in Southern California. In the foreground is Leak herself blankly staring back at you, perhaps a sign of her struggles with mental illness that would plague her personal and professional life until her death. Virginia Louise Leak was born in Iowa City, Iowa, on June 28, 1940. She was the second daughter of Arthur and Irene Leak. The family moved to Dallas when Louise was 5. There were two and a half years age difference between Louise and her older sister, but Jane said the two were quite different during childhood. 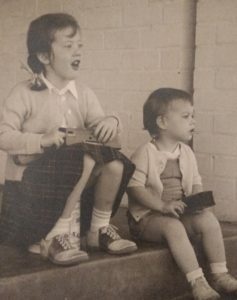 Myers recalled that she and her sister endured attending Catholic grade school together. While her sister attended the University of Texas, Leak was an honor student at Highland Park High School before attending Lindenwood College near St. Louis and earning her bachelor’s degree. She later received her MFA from UCLA and established herself in the Los Angeles area. 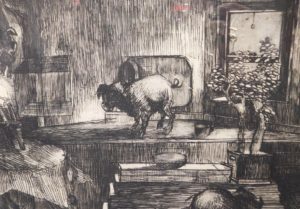 “One Pig’s Tale,” an etching by Louise Leak. Last year, Myers wanted to learn more about her late sister, so she traveled to Lindenwood College in Missouri and met Leak’s former art professor, John Wehmer. The 90-year-old Wehmer arranged for Myers to visit the college’s library to view etchings done by Leak as a student. “One of the curators told me ‘I’m going through her collection now and getting ready to do a retrospective. Her work was so dynamic and it really spoke to me,'” Myers said. Today, Myers has a fuller appreciation of her sister’s artistic ability and her vast body of work. A handwritten note by Louise Leak. Myers took a different life path than her sister. She earned a degree in radio/TV journalism and got her first job with KPIX in San Francisco. Meanwhile, Louise was in Southern California doing her own thing. She lived a “flower-child” lifestyle, complete with a Volkswagen minibus. 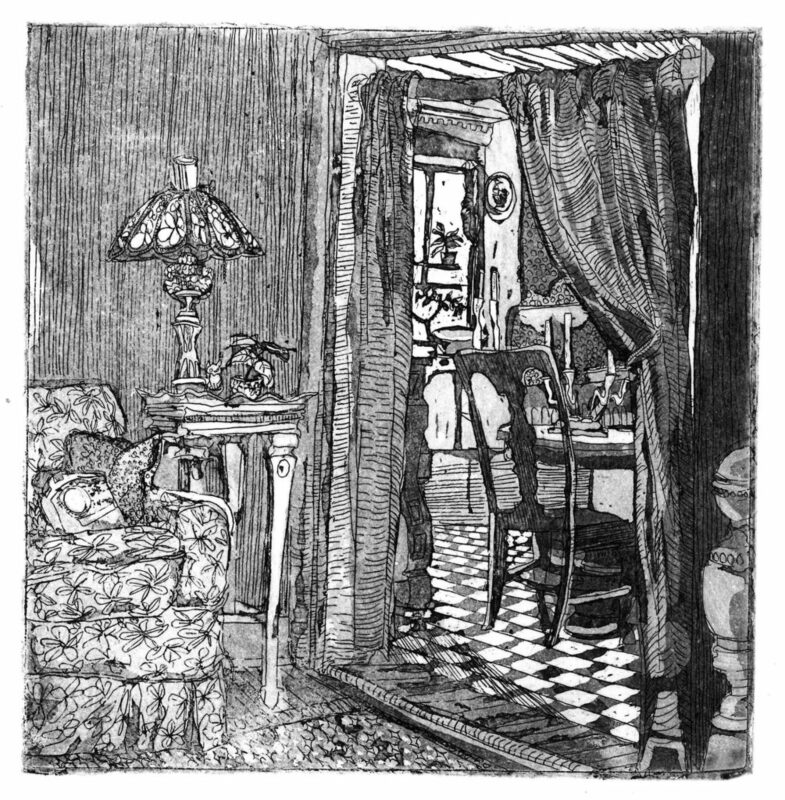 An early etching by Louise Leak. One image of her sister is ingrained — etched? — in Myers’ head. 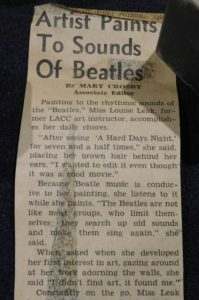 A newspaper clipping explains how Louise Leak used music by the Beatles as her muse. But there was also a dark side to Louise Leak that comes through in much of her work. Myers said that Leak’s mental health began to decline while she was in college. “They didn’t know how to treat it back then,” Myers said. “I think she suffered greatly with this torment. Her artwork, her friends and her poetry helped her cope. When she was at UCLA, it started manifesting itself. Leak eventually moved back to Texas, but her mother retreated to Gainesville when she could no longer handle her youngest daughter’s irrational behavior. Leak once took a bus to Gainesville, but her mother quickly bought her a return ticket back to Texas. 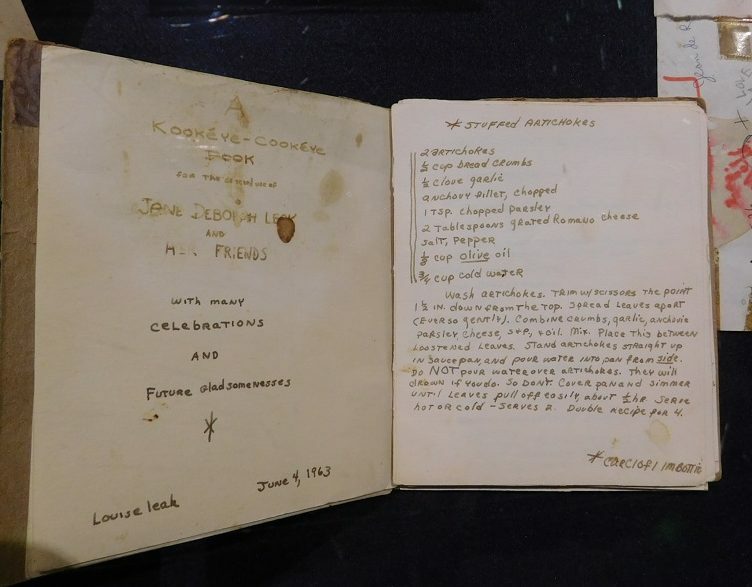 The Thomas Center Galleries exhibit includes a recipe book written by Louise Leak. Eventually, Leak was institutionalized. She was living in a halfway house in Dallas in 1978 when she stuck her finger in a jar of peanut butter and stuck the thick substance in her mouth. The peanut butter lodged in her throat. Leak spent three days plugged into a respirator at Parkland Hospital before giving up her fight. It is a sad story, but one that could have a happy ending if people go to the Thomas Center Galleries and study Leak’s work. And that is Myers’ mission. Myers said that “Into the Light” contains many parts of a puzzle that can be pieced together. 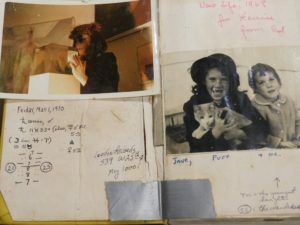 In addition to the artwork, the exhibit contains two displays of Leak’s ephemera, including a recipe book, photos, newspaper clippings and collages. You could say that Myers, who turns 80 next month, is on a mission. Enjoy a self-guided tour of downtown area galleries and other art spaces on the last Friday of each month. Artwalk hours are 7-10 p.m. (unless noted). Some of the venues feature live music or performance art. Most offer some refreshments. First Magnitude Brewing Co. (1220 SE Veitch St.): Hosting a variety of artists and fun. Also enjoy the atmosphere of a local craft brewery. Food trucks and beverages available. NOTE: Artwalk hours 6-9 p.m.
Civic Media Center (433 S. Main St.): The home of free thought and expression. See online calendar at civicmediacenter.org. Find on Facebook for details. 352-373-0010. 9th annual Cinema Verde Film Festival (101 SE 2nd Place): A booth will be set up to inform about the environmental films that will be screened at the Hippodrome Theatre on Feb. 8-9. Cinema Verde is a Florida not-for-profit corporation designated as a 501(c)(3) public charity by the IRS. Contributions are tax deductible. Maude’s Café (101 SE 2nd Place): Diana Diaz (Dee Carolina/Feral Ursa), a second-grade teacher and mixed-media artist, uses the process for each piece as part of her therapeutic regimen. Her abstract paintings include both random and deliberate images under organic materials such as plants, wood and insects — all sewn and glued, creating something that resonates with all of us. 4Most Gallery (534 SW 4th Ave.): Presenting Le Vie Est Ailleurs, a solo exhibition by Dina Benbrahim, MFA candidate in Graphic Design at UF. Dina exhibits photographs taken in her home country of Morocco during the month of Ramadan. 4Most Gallery is supported by UF’s School of Art and Art History and aims to connect SAAH students, alumni and faculty with the greater Gainesville community with innovative, dynamic exhibitions and programming. Artisans’ Guild Gallery (201 SE 2nd Place, Union Street Station): A new year brings new fine art and crafts for home or office at Gainesville’s most comprehensive collection of regional artists and fine craftspeople. Hours: Monday-Saturday 10 a.m.-7 p.m., Sunday noon-5 p.m.
Black C Gallery (201 SE 2nd Place): Showcasing a mix of photography and digital collage works created by Ani Collier. 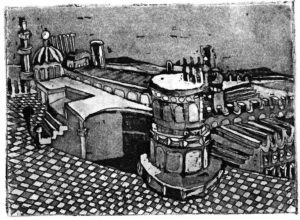 (www.blackcproduction.com) New Hours: Tuesday-Saturday noon-6 p.m.
Sweetwater Print Cooperative (117 S. Main St.): Presenting “Comics as Comment,” exploring the long-time link between printmaking, comics and social commentary by artists in many different styles and media. Show continues through Feb. 21 and may be seen Thursday afternoons, Friday mornings, and by appointment by calling Stewart Thomas at 352.514.3838. The Bull (18 SW 1st St.): Presenting Josh Wilson and “Faces I Can See.” In this portrait series, Wilson offers both an expressive representation of the subject and a window into who they are, painted on large wooden panels. (www.joshuawilsongnv.com.) Followed by live reggae performed by Maca Samba. City Church (19 SW 1st St.): Featuring Stacey Fletcher Reynolds a cathartic painter, visiting from Ormond Beach. She says “I exhibit work that seeks to evoke emotions, questions background, and the journey of one’s self.” Contact Reynoldds at 865.406.6899 or www.staceyfletcher.com. Mind Space Collective (834 E. University Ave.): Inviting you into JMC’S #futurecave of primitive expressionism that takes a leap into the future by looking back into our primordial instinction. Timber Line Jewelry debuts its earring collection influenced by JMC’S abstract chalk creations and Timber Line’s wooden geometric gems. Enjoy complimentary, art-inspired cocktails with Madrina’s bartender Clara Leibinger and access to the charcuterie bar. Third House Books & Coffee (113 N. Main St.): Featuring Heather Halak’s nature photography features and Jarrod Harris’ work in portraiture that highlights the diverse human condition in Florida. Adjacent Downtown Wine & Cheese will be open, offering food and beverages for purchase. E’Lan Hair Studio (115 N, Main St.): “Don’t Eat Anything White,” photography by Dan Rountree. The Vine (627 N. Main St.): Featuring art by Nikki McClure and happy hour that includes a complimentary cheese plate with purchase of a bottle of wine. Also, live music by Rebecca Vincent from 7-9 p.m.
Thomas Center Galleries (302 NE 6th Ave.): Evening begins with 6:30 ribbon-cutting and dedication of the Doris Bardon Gallery, named in recognition of the generous endowment gift to the Gainesville Arts & Parks Foundation from the Arts Association of Alachua County. The Thomas Center’s Mezzanine Gallery is now The Doris Bardon Gallery in honor of the late arts leader. “INTO THE LIGHT | The Rediscovered Paintings and Prints of Louise Leak” is featured in the first-floor Main Gallery until 9:30 p.m. With live performance by musician Agapitus “Augi” Lye. Visionary Crossfit (716 N. Main St.): Presenting Gainesville Goddess Visions Show, featuring three galleries of art, live painting and music; Goddess presentation, yoga, dance, meditation, and women’s self-defense demos; art raffle, tacos, drinks + dancing. Unique and fun family-friendly show from 7 p.m.-2 a.m. Free before 9 p.m./$8 cover after 9 p.m. Artists: Onna Maya Meyer, Frances Aiom, Sarah Whitmire, Carrie Martinez, Tracy Kunce-McDurman, Samantha Simons, Jessica Wilson, Xylena, Judi Cain, Clara Ortega, Kayleigh Ryan, Tori Murray and Tim Malles. Featured DJs: DJ K8, Spindle, Kashmira, Mariposa, FAKE, LZRKMMNDR, Mickey Flair and John E Whoops and food by Soul Spice. Loved your article on the artist Virginia Louise Leak, which I linked to off The Point (WUFT-FM). Will try to show up tonight. Thanks, Jeffrey. We appreciate WUFT’s The Point email newsletter for helping us get the word out about such a wonderful, powerful art exhibit.